It’s 1953, 16 years after world famous double act Laurel and Hardy split up as a result of studio power after the duo attempted to negotiate a production deal that would remunerate them to the same scale as contemporaries. Unfortunately, thanks their powerful producer (Hal Roach, hammed up by Danny Huston), and a contract situation things went a different way. Now ageing and in the twilight of their careers, they embark on a music hall tour of Great Britain and Ireland to drum up support for a movie that gag-writer Laurel has been trying to complete. Initially, support is on the thin side for the fading stars as they embark on a tour managed by a distinctly dodgy manager, but there is drama ahead as the increasingly popular tour comes to London. 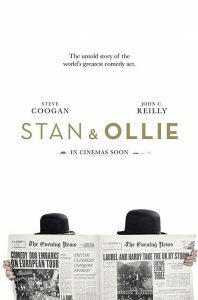 Steve Coogan (as Stan) and John C Reilly (Ollie) do sterling work, with much respect reserved for Reilly’s performance after hours of make-up as the duo work out their differences and entertaining the crowds at their venues. Coogan’s voice acting is spot on while Reilly gets the physical side just right as they recreate some of the duo’s famous routines on stage. Stan and Ollie does more than just explore the dynamic between the titular duo, though, and their respective wives get their own story arc. Ida (Nina Arianda) and Lucille (Shirley Henderson – she famously portrayed Moaning Mytle of Harry Potter fame) are both supportive and protective of their loving husbands. Each character in this effective four hander has nuance and a story arc but there is also a tinge of sadness as the tour reaches a moment of crisis in London. All four lead the bittersweet drama towards a slightly predictable but no less emotional close and there’s a brief montage of original scenes as the credits begin to play out. In all, it’s a quietly effective drama that doesn’t outstay its welcome. Summary: STAN AND OLLIE is a biographical drama in which comedians Stan Laurel and Oliver Hardy embark on a tour of Britain. This entry was posted in Shooting The Breeze and tagged film review, Stan and Ollie. Bookmark the permalink.